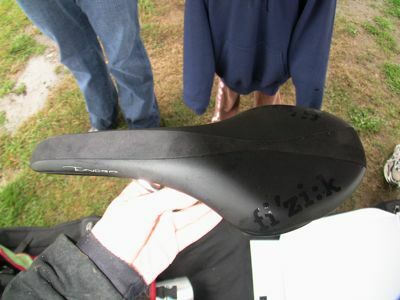 It’s not really a secret that I like Fizik saddles. I’ve got six bikes and all of them have a Fizik saddle. My favourite saddle for road bikes is the Arione, because of it has very little sag from the nose to tail and a squarish top. However, the long tail at the end of the Arione has a bad tendency to catch your shorts (or worse, your scrabble bag) while riding technical terrain. Enter the Tundra saddle. A LOT like a Arione…just a touch more padding and minus the can-opener on the tail. 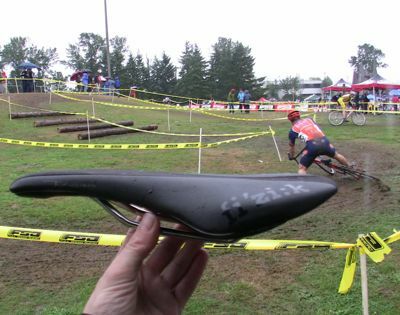 The picture below was taken at the Starcrossed cyclocross race last weekend, after my race. Notice the racer in the background….he’s in mid-wipeout. Available really soon and also available in white with carbon rails. Previous Previous post: Are you going to Interbike?